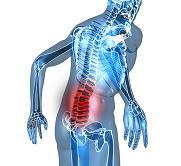 Low back pain causes are clues to overcoming back pain and obtaining lasting pain relief. Remove the causes (often life-style related) and the symptoms will often disappear. Other than causes related to injury, back pain is most often related to lifestyle - we do it to ourselves. Take a look at the following list of contributing factors to low back pain and you may find a clue to something you can do to help reduce your pain. 1. Drink Plenty of Water Water is so important to humans that without it we could not exist. One of the most basic yet common causes of pain is dehydration. Not having enough fluid in the body to keep the body cool, the blood moving, the muscles supple, the tendons relaxed and the discs well hydrated causes pain. Not only must you drink plenty of water, but you must also avoid coffee, tea and soda as these all cause you to sweat and urinate resulting in dehydration. 2. Sit Straight One of the worst things you can do for your back is prolonged sitting. That's because the "C"-shaped posture most people slump into puts serious stress on the spine. You may not feel any discomfort right now, but the medical consensus is bad posture will cause you pain... sooner or later. 3. Reduce Inflammation Inflammation is a response from your immune system against an irritant. The swelling is your body's way of running to the problem with fresh blood, antibodies and vital cells in order to begin healing and repairing the damage. The problem is, after around age 25, our production of healing enzymes drops off so there is nothing to tell the body to stop the inflammation. 4. Change Your Diet The amount of inflammation in your body varies and is dependent on a number of factors -- including your activity level, the amount of sleep you get, the degree of stress in your life, and especially the foods you eat. What you have to realize is that these factors are cumulative, meaning they build up over time. And the more that any or all of these factors get out of balance, the more the risk for pain and disease increases. There are foods that help reduce inflammation and foods that make it worse. You need to know which are which, if you want to be pain free. 5. Don't Wear Heal Lifts Leg-length discrepancies are often caused by how we hold ourselves, how we stand. Women carrying babies on one hip, say, can produce discrepancies. In general, habits, patterns, posture and positioning - things we do all day long - control the way our pelvis is conditioned. Very specific sets of muscles are associated with a discrepancy. Until you know your true condition, you cannot know exactly what to do. But the postural dysfunction must be dealt with and wearing heal lifts only masks the real problem. 6. Release the Mind If you have exhausted mainstream medicine, physical therapy, massage, chiropractic, acupuncture, surgery... yet the pain persists... I would like to suggest you consider the possibility that the mind and emotions play a key role in your chronic condition. You need to know three of the safest, easiest and most powerful mind/body systems for eradicating chronic pain and associated symptoms. 7. Exercise Properly You need to develop a balanced and stable body. But also understand that the very cardio exercises could be making your condition worse. And training the wrong muscle groups is probably making your pain much worse by developing or perpetuating muscle imbalances. In simple terms, a muscle imbalance occurs when you have overdeveloped and tight muscles in one area of your body while the opposing muscles are weak and stretched out of their normal position. 8. Your Condition May Not Be So Important Once given a diagnosis do not feel like you need to cure your condition to be pain free. Studies have proven that you can have a diagnosis and not have pain. You see, there's a hidden cause of back pain and it's something very few medical or healthcare professionals are even aware of. For example, if you were diagnosed with a herniated disc, instead of just treating the symptoms, they should be finding out what caused the disc to herniate to begin with. 9. Get Proper Sleep You spend between six and 10 hours a night in bed. That's one-third of your life. And when it comes to back pain, those are some of the most important hours in your day. Sleep helps your body heal. It's really the only time your muscles can completely rest and recover. There are a ton of studies linking sleep with healing. They show that, among other things, human growth hormone and melatonin, both of which play a big role in tissue recovery and immunity, are produced during sleep. So if you're not getting good sleep-whether it's due to pain, anxiety, fear or whatever-you're not giving your muscles, especially your back muscles, time to rejuvenate themselves for the next day's activities. 10. Knowledge is Power Never stop educating your self about how to achieve optimal health and pain-free living. There are so many diagnoses out there and even more treatments available to try. The best way to put an end to your pain and suffering is by educating yourself about as much as you can to do with low back pain causes and then avoid doing those things. So there are ten important points about low back pain causes and solutions. Just knowing what the common low back pain causes are can give you greater opportunity to avoid back problems. These are very professional and I would encourage you, if you know anyone with any of these problems, to please share this information with them. Back problems are often long term and sometimes lifestyle changes now can short circuit low back pain causes and avoid back pain later. Also, I would encourage you to get this free Lower Back Pain Remedy Audio Information. This is valuable information currently being offered free and is normally sold for $79.